None of the game's code is in RAM, except for a small routine that does nothing but wait. So, still, nope. - Program counter points to location #1. - Talk to Time Capsule attendant, game runs guard code. - After the guard passes, program counter is pointing to location #2. - The player is allowed inside the Time Capsule. - Use Coin Case, running code that's identical to talking to the Time Capsule attendant and the guard code, except with the Mail check missing. - Manually jump to location #2. Thank you very much @Torchickens! Very simple indeed. @SatoMew: To answer your question, it is difficult to say. But what I do know is that the Mew glitch was discovered very early. Because for the Nintendo Space World 1997 Distribution they made a Flyer where they even mentioned the Glitch. So the glitch must have been well known at this point. "This is not a bug! Let's get Mew genuinely!" I know that ゲーフリ is the abbreviation for ゲームフリーク of course. The official VC Mews have 0 padding between actual Name and the Terminator. This can't be seen in Gen 1 but in Gen 2 the names aren't getting handed well by the character encoding, since 0x00 isn't Space, it's NULL in Gen 1 and in Gen 2 it's ?. As a result ミュウ becomes ミュウ?? and ゲーフリ becomes ゲーフリ?. This is also the case in the English GF Mew counterpart, where it looks even worse since the names are longer. It's "freaking" weird. Isn't it funny that an official Event Pokémon can look even more glitchy than a glitched one? Tell me what is a bug now GameFreak?! 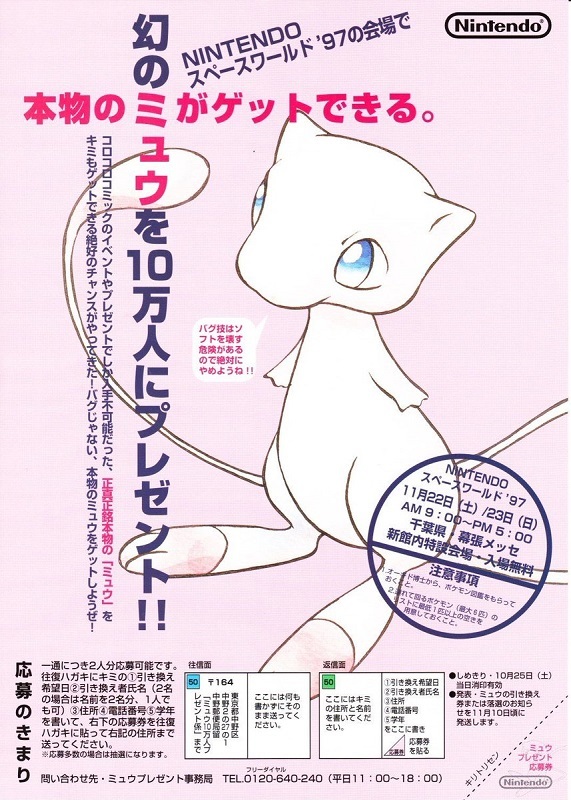 Interesting, because it is considered that the discovery of how to get Mew using instant encounter (aka "Mew Glitch") was made on 2ch by fifth in 2003, hence the first name given to the Ditto Trick, "fifth's method". This would mean the glitch was actually known among players and developers as soon as 1997? I don't think it's necessarily referring to fifth's method. Before 2003 the Trainer escape glitch (fifth's method) wasn't the only means of obtaining Mew. There was a method that preceded the Trainer-Fly glitch involving the Select glitch and a Pokémon with Water as its second type known in at least 2001 or earlier, so it's possible that was known in 1997, although I don't know who discovered it. Zerot: I think the glitch involved renaming a Magikarp to Myuu or something. I am not sure, however it shouldn't be too hard to find out. Furthermore this is another popular method for obtaining Mew that may have been known before fifth's method. Thank you for your detailed post, it was very informative! And you even found a better copy of the flyer, too! Thanks Torchickens, I was suspecting there was a way to smuggle out a Mew from a Select glitch but I wasn't sure, and didn't know about this other glitch. This made me realize the Yami Shop glitch works in our games, for some reason I believed it to be a jp-exclusive. Cool! Yeah, I used to think it was a Japan-only glitch as well until TheZZAZZGlitch made a video of it (link) in the English versions. It's a great glitch. Here we go! The bank is now available for G/S. Could anyone try to send a Celebi obtained through Celebi egg trick? I didn't create my Celebi using the usual Celebi-Egg glitch, instead using ACE and let one hatch out of an Egg just to verify. Didn't transfer though. Since all my Celebi had wonky levels maybe that's the reason, though. Also worth noting that Pokémon musn't hold an item to be transferred. Contrary to B/W transfer item isn't just removed, but the pokémon blocked from transfer instead. The distributed Celebi for the purchase of VC Gold/Silver has an OT of Ilex with an ID of 040601. It's worth a try if that helps. At least level 30 with mentioned moveset, no item, self as OT didn't help. When I get free time, I can make a code that generates a (hopefully) legitimate one. It is not very surprising if only the Celebi with correct ID and OT passes the bank. After all that's what must be done with Mew. But I guess we should be trying a lvl30 Celebi without modifying OT and ID just to make sure. Epsilon just checked, and there has been a Celebi distribution in Europe, with OT "FRANCO". OT ID may not matter. This was a Gen II distribution, no? No way it passes since you couldn't pass Pokémon from Gen II to Gen III. However starting from the HG/SS event Celebi WIN2011 that unlocks the battle with Giovanni, there has been at least 4 distributed Celebi: this one, the one from the Bank in 2014, the GF one in 2016, and the Ilex one. Among them, the one from the Bank is the only that has your OT and ID. Therefore I'm not sure it is important to have a specific OT/ID. 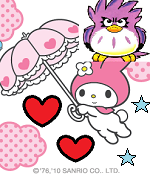 However, the lvl (10), moves (Recover Heal Bell Safeguard Hold Back) and ability (Natural Cure) may be important. Unless they blocked every Celebi coming from G/S.